Dave observed the other day on Twitter that, over the past calendar year, Mark Buehrle has been one of the better and more valuable starting pitchers in baseball. A lot of that has had to do with home-run suppression, and if you read FanGraphs often, you know how we generally feel about home-run suppression, but the larger point is that, after getting off to a rough start in Toronto, Buehrle turned things around and continues to get batters out to this day. His strikeouts right now are basically the same as ever, and every game batters against Buehrle return to their dugouts shaking their heads. He is what he has been, allowing him to feel ageless. Consider everything about Buehrle and you might assume that he’s pitching like he always has. Why mess with what’s been working? Buehrle’s always been a little bit deceptive and a little bit finesse, and it’s not like you very often see a pitcher in his mid-30s make an approach adjustment. 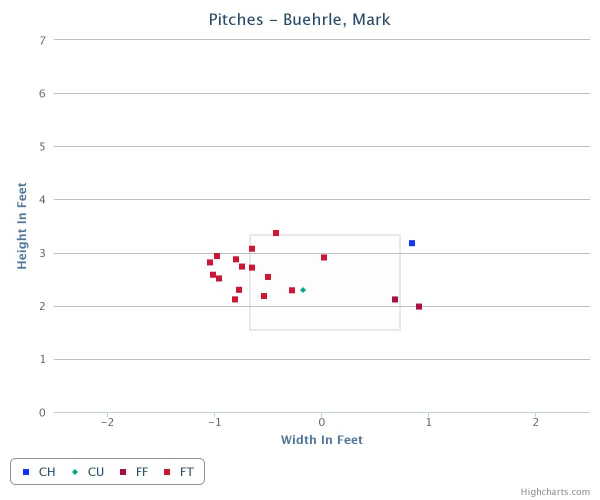 But if you dig beneath the 2014 Mark Buehrle surface, you notice something you can’t un-notice. Of his 31 strikeouts, 20 have been called. This is unusual, and this has an explanation. Right now, Buehrle’s on pace to shatter at least his recent high. Better than two-thirds of his strikeouts of righties have been called, and at one point eight consecutive right-handed strikeouts were called. Or, if you prefer, 12 of 13. Buehrle got out to an incredible start, confusing the hell out of the Rays on April 2, and he hasn’t kept up that pace, but the numbers now are the numbers now, and this isn’t typically Mark Buehrle’s game, as much as it feels like it is. Over Buehrle’s career, before this season, 29% of his strikeouts were called, which is only a little above league average. He’s presently at 65%. Last year’s high, among qualified pitchers, was 48%, shared by C.J. Wilson and Lucas Harrell. Vance Worley was at 57% in 2012. Bartolo Colon was at 56% in 2011, with Worley at 55%. To find something in the 60s, you go back to 2003, when John Burkett finished at 63% and Rick Reed finished at 62%. In the strike-shortened 1995, John Doherty finished at 70%. He’s the only qualified pitcher since 1988 to beat Buehrle’s current rate. A few on the outside. One down the gut. A big clump around the inside edge. That’s by design, and this is a reflection of a new thing that Mark Buehrle is doing with tremendous frequency. The thing about Buehrle is the diversity of movement he can generate. Most obviously, he has a changeup and a curveball, but he also has a cut fastball, a straighter fastball, and a running fastball. Brooks Baseball classifies those as a cutter, a four-seamer, and a sinker, and we’ll stick with those labels. The big change has to do with Buehrle’s sinker, and I had to check this a bunch of times to make sure I wasn’t making a mistake. The difference is enormous. What used to be an almost forgotten pitch has become a favorite weapon. Previously, Buehrle’s sinker accounted for about 6% of his strikeouts of righties. This year, that’s up to 61%, as Buehrle has caught hitters unprepared for his sinker’s location and movement. It’s astonishing, the way Buehrle has put the pitch to use. Against righties this year, with zero strikes, Buehrle has thrown one of 92 sinkers over the inner edge, or beyond. With one strike, he’s thrown one of 26 sinkers inside. With two strikes, he’s thrown 43 of 57 sinkers inside. He’s set hitters up by working them away, and then with two strikes, Buehrle has tried to run the sinker back over the plate, finding the front door. Before, Buehrle didn’t use the sinker very much with two strikes against righties. When he did, he threw 36% of them inside. So far this year he’s more than doubled that rate while throwing the pitch far more often overall. Trying to get strikeouts with front-door running fastballs isn’t unique to Buehrle — this is kind of the Johnny Cueto game plan, and Bartolo Colon’s, too — but Buehrle hasn’t done this much in the past, and that’s what makes this interesting. Now 35, Buehrle throws the same pitches as ever, for the most part, but he’s learned to use them differently and perhaps stave off a decline that otherwise might’ve already arrived. To this point, the story of Mark Buehrle’s 2014 has been his sinker. He’s used it differently from how he has in the past, and it’s allowed him to post similar numbers to his track record. Because so much of what we do is basically about trying to predict the future, the question is how long this approach can last, before opponents begin to adjust and look for the sinker inside. We tend to be more skeptical of called strikeouts than swinging strikeouts, since swinging strikeouts seem to be more sustainable. I get the feeling Buehrle won’t be able to keep up his current rates all season long. But, he’s gotten by for this long, so maybe he shouldn’t be doubted. And if hitters do pick up on this, there’s nothing stopping Buehrle from making another kind of change to stay one step ahead. I mean, he’s done it before. That’s what this whole thing is about. Eventually, Mark Buehrle will be finished, but that day’ll probably come long after it by all rights ought to. We hoped you liked reading The Old Mark Buehrle’s New Trick by Jeff Sullivan!